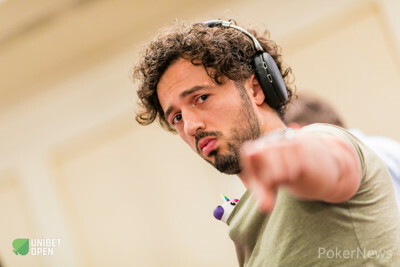 Yaron Turgeman is the chip leader after Day 1a of the 2018 Unibet Open Bucharest Main Event, bagging 302,500 chips after 11 one-hour levels of play. With that, he’s the only player to have over 300,000 in chips. Turgeman is followed by Carmen Zainescu (240,500) and Mateusz Moolhuizen (212,000). The tournament started with just 37 players in their seats but all the tables filled up during the first two levels of the day. The total number of players on Day 1a is set at 149 players. At the end of the day, there were just 32 players who bagged a stack for Day 2 and it was Turgeman who bagged the biggest. Zainescu and Moolhuizen complete the top three of biggest stacks to survive Day 1a. Players who busted the tournament today have the opportunity to reenter the tournament on Day 1c, August 3, 8 p.m. local time. Some of the notable players that entered Day 1a but weren’t able to make Day 2 include Unibet Ambassadors Sophia White and Daiva Byrne, Unibet.fr Pro Quentin Lecomte, Dehlia de Jong, and Gerrit van Lancker. Sander van Wesemael started the day off really well and he was the chip leader of the tournament after two levels of play, but he wasn’t able to maintain his stack and he busted out a couple of levels later. Zainescu is a familiar face at Unibet Open Bucharest. She won the Ladies Event in December of 2017 after she beat De Jong heads-up. Zainescu and De Jong were reunited today as they played on the same table for a portion of the day. They weren’t the only ladies in the tournament. Unibet Open tournaments attract quite a lot of women and today they even had Molly Bloom in the building, of the movie "Molly’s Game". Unibet Open regular Moolhuizen was able to make Day 2 of the Main Event with the third biggest stack so far. Moolhuizen had been grinding steady throughout the entire day and he finished with 212,000. Emelie Svenningsson had the chip lead at one point in the tournament, playing a stack of over 200,000, but she wasn’t able to end the day on a high note. She ended up bagging a below average stack of 75,500 when the day was over. Marius Gicovanu (207,500), Adrian Ionescu (205,000) and Ciprian Voican (202,000) are the only other players with stacks over 200,000. The PokerNews team will be here in Bucharest to report on the tournament from start to finish. Day 1b will kick-off Friday, August 3 at 11 a.m. local time and for the players that have busted today’s Day 1a or tomorrow’s Day 1b, there’s still a chance to make Day 2 through the turbo Day 1c, with 20-minute levels instead of 60-minute levels. The players that will make Day 2 will combine on Saturday, August 4 and they’ll play to a winner on August 5.